The clear fluid occupying the space between the cornea and the lens of the eye. The aqueous nourishes the lens and epithelial cells. The choroid is a layer of blood vessels that lies between the retina and sclera. These blood vessels nourish the back of the eye. The conjunctiva is the thin, transparent tissue that covers the outer surface of the eye. The cornea is a clear, dome-shaped outer coating that covers the front of the eye. Light passes through the cornea to the lens. The cornea provides much of the eye’s focusing power. The fovea is the center area of the retina that receives the focus of an object. Nerve cells are more densely packed in this area, which allows the fovea to focus images in greater detail. The iris is the colored part of the eye. Tiny muscles inside the iris dilate (widen) and contract (narrow) the size of the pupil, much like an aperture on a camera. The lens focuses light onto the retina in the back of the eye. 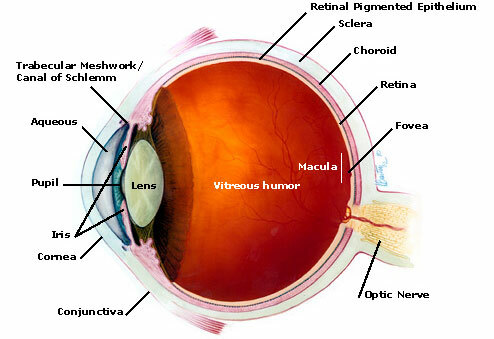 The macula is the small and highly sensitive part of the retina responsible for detailed central vision. The macula allows us to appreciate detail and perform tasks that require central vision, such as reading. The pupil is the black, circular opening in the center of the iris. It regulates the amount of light entering the eye. The retina is a very thin layer of light-sensitive tissues that line the inner part of the eye. It is responsible for capturing the light rays that enter the eye, converting them to light impulses and sending them to the brain for processing. A layer of pigmented cells that nourishes and supports the retina. The sclera is the tough, opaque tissue that serves as the eye’s protective outer layer. It is also known as the "white of the eye." The passageway in the eye for aqueous fluid to leave the eye.